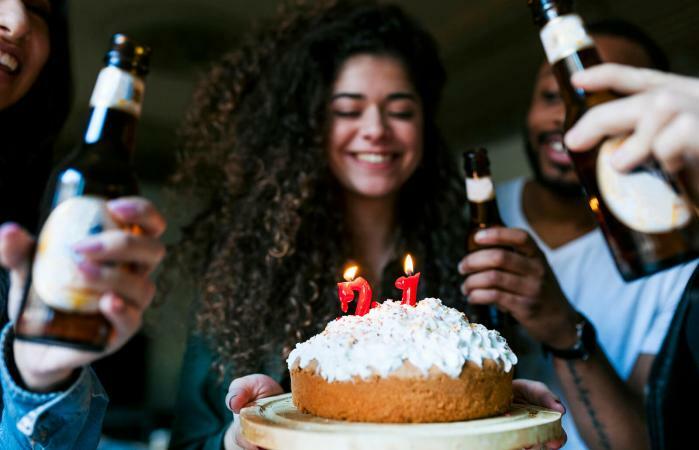 Toast your friend or family member on his birthday with a great speech that celebrates what turning 21 is all about. Whether your friend is planning to have a few drinks or just wants to celebrate this milestone occasion, tailor your speech to suit your friend's birthday style. Each speech is editable and can be downloaded using Adobe Reader. A 21st birthday is often one that stands out in people's minds for years, simply because of the milestone year. For a fun-loving birthday gal or guy who is excited to have a first alcoholic drink, this is definitely one s/he will remember for years. Bring up some past birthday moments and allude to making more in your speech. 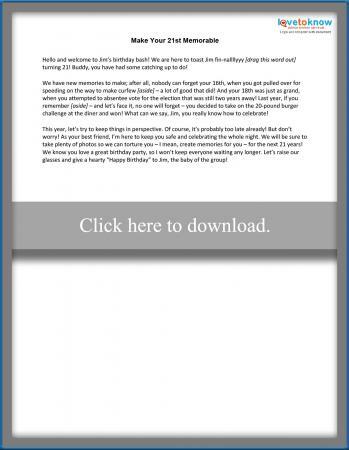 Click to download the speech. Not every 21-year-old is going to have a birthday bash that involves a wild party. Instead, they may simply want a low-key adult birthday party. A speech for this celebrating 20-something and friends can focus on their full entrance to adulthood, past accomplishments, and future endeavors. It should be optimistic and celebratory. Click to edit and print the speech. At a party with a theme, such as tropical oasis or retro 90s, tie the speech into the theme. Work in related phrases and even rhymes! For a truly unique birthday speech, consider writing a list of 21 "things" about your friend or family member. This could be related to anything; for example, you could talk about 21 funny moments in their life or 21 things you love about him or her. Don't make too many jokes about drinking unless you know it's okay with the birthday person. This can be something he or she is worried or nervous about, and you don't want to add stress to the event. Keep things clean; don't include raunchy or risque jokes, even among friends at a party where people are imbibing. You don't want to give a speech in poor taste, especially if someone is recording the event. End the speech by raising your glass in a toast. If the birthday person isn't a drinker, end by wishing him or her Happy Birthday and invite others to join you. 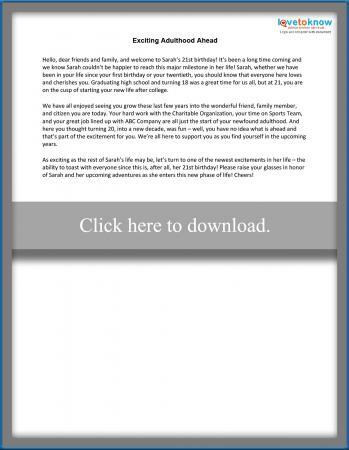 A great birthday speech for a 21st birthday is one that honors the birthday person and suits his or her personality. Add a few light-hearted jokes, and you're sure to give a speech that makes them feel great about this milestone celebration.